As a strength coach, trainer and university professor who specializes in resistance training, I have heard all the excuses for not training legs: "I just want a bigger chest and arms." "I'm not worried about my legs." "Squats hurt my knees." "Deadlifts hurt my low back." "I just want my upper body to get a little bigger and more toned." "I don't want to get slow or lose athleticism." "I'll just wear sweat pants to the beach in August." And, of course the excuse that has caused me to roll my eyes, sigh and shake my head (at least internally) more than any other pathetic reason people give for not doing leg training: "I do weights to bulk my upper body and jog to ton my legs." A few weeks back I had an accident on the gymnastic rings and smashed my foot. During that time I followed my principle of always looking for a way to train around the injury. I also tried to look on the bright side and use it as an opportunity to focus more on my upper body - which has always lagged behind. However, I ran into a huge problem - I have never been able to grow my upper body without also doing some heavy, intense leg training. Some people are blessed with great upper body genetics. As a result, a few curls and bench presses later and they have an impressive upper body. However, if you are like most people, building the upper body is challenge - especially if you fail to put in your time in the squat rack. One of the three fundamental training principles is specificity. The concept behind this principle is that exercise-induced change is specific to the type of stress. Therefore, one could logically conclude that all you need to create a bigger, stronger upper body is upper body training. One of the things people often fail to realize about resistance training is the powerful effect it can have on your hormonal system. The body is designed for survival. Therefore the greater threat you pose on its survival the more serious it is about adapting to the stress. Sure cable crossovers are fun - they are easy to do. After all it is easy to feel the burn and you get to practice posing in the mirror all at the same time. However, they pose little treat to your survival. Full range of motion squats done with heavy weight are brutally hard and thus incredibly effective. 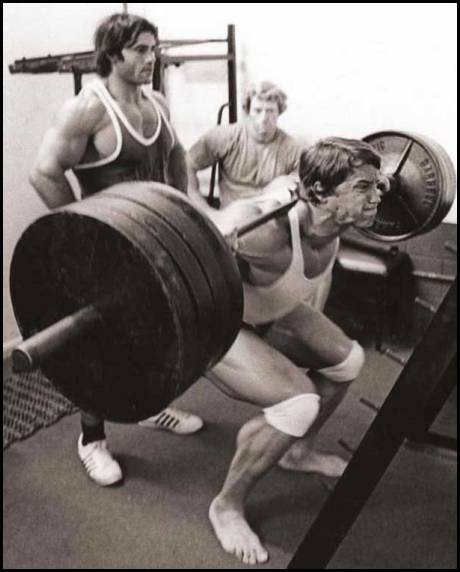 When you get under a heavy bar to squat you give your body a serious threat - get stronger or get crushed! The body has no desire to get crushed so it responds by getting stronger. 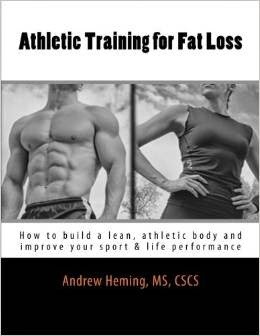 In this process the body increases production of anabolic hormones such as testosterone. As a result, not only do your legs get bigger and stronger, there is a spill-over effect that positively effects your whole body, not just your legs. 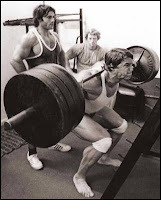 I''ll address those other issues of "squats hurt my knees" and the loss of athleticism in future posts. The body grows best as a unit. Even if you don't care about being strong (I'm sorry, I just don't understand that) or even if you honestly don't care at all about your lower body development, heavy lower body training is a huge help to building a bigger, stronger upper body. This is especially true for those who do not use drugs and have to make their own testosterone in the squat rack. Don't make the mistake that so many have made in the past of neglecting heavy leg training. I'm not saying don't train your upper body at all. You need to train it hard, but in addition to not in exclusion of intense lower body training with big exercises like squats and deadlifts. I know this message is not new (those in the know have been preaching it for years), but until there are line-ups at the squat rack on Monday nights (and people actually use them to squat and not to curl) this message needs to be preached. If you already know to do this, please share this message with someone who needs to hear it!